Picture a young woman, filling her diary with her angst. It could very easily be today. The emotions of youth often push us to feel that we will never amount to anything, never get the chance to use our talents and gifts. Yet the words in that journal were penned more than two hundred years ago by the woman Elton Trueblood said “…became the most famous of all Quaker heroines.” [The People Called Quakers, p. 168] Where did she find meaning? How did she defeat the devouring moths and rust? Elizabeth Gurney Fry’s life as prison reformer, minister, and philanthropist demonstrates to men and women today the wonderful blend of faith and social action that arises out of a love for Jesus Christ. 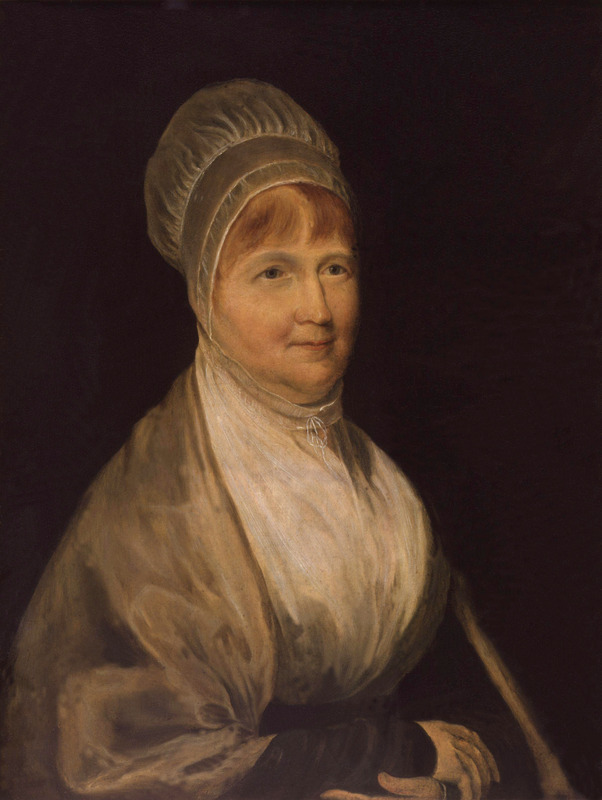 I first discovered and wrote about Elizabeth Fry when I was in seminary, and she piqued my interest precisely because of that blend of faith and social action. Two weeks ago, I spoke about Billy Graham, and his influence as an evangelist in our cloud of witnesses. And Elizabeth’s kind of influence is just as important! The work of acting to improve the lives of others out of love and obedience to Jesus Christ is as world changing as Graham’s ministry. Elizabeth was born in 1780 into the Gurney family, a family of Quakers widely respected in the banking world of England. Her brother, Joseph John Gurney, became a powerful preacher on both sides of the Atlantic, while Elizabeth herself became most famous for her work in reforming the brutal condition of women’s prisons in her time. Before her death in 1845, her obedience to God led her to accomplish much more. Her actual achievements were extraordinary. Mother of ten surviving children, she had gatecrashed into public life, into an exclusively male preserve, when the very idea was unthinkable. Through her passionate crusade, she succeeded in rousing the world’s conscience to the pitiable state of women in prison and created a glimmer of sympathy for the mentally ill and the poor. She also instituted an order of nursing sisters. It was precisely her striving to be faithful in the little things, not a desire to be a world-renowned reformer, which brought her into the bright light of public acclaim. I think this is an area where Elizabeth has a lot to speak to today’s world. We want to change the world. In many ways, the young adults of today live and breathe to be world reformers. Elizabeth demonstrates the kind of day in, day out obedience…a “faithfulness in the little things” which is what leads to making such a large impact on the world. In Luke 16:10, after telling some stories about taking good care of what we’ve been put in charge of, Jesus said this: “If you are faithful in little things, you will be faithful in large ones. But if you are dishonest in little things, you won’t be honest with greater responsibilities”. Elizabeth’s wisdom shows in her words and actions: attending to the small things, trying to be faithful in the little. What changed between 17 and 20? What brought about the maturity that could see that the Christian life essentially boiled down to being faithful in the little things? In part, it was the providential intervention of two Quaker ministers into Elizabeth’s life: William Savery and Deborah Darby. “Plain Friends” of her time held on to all the old images many of us have of Quakers. Plain Friends stuck with Quaker gray, not brightly dyed colored clothes, dressing and living as simply as possible. The Gurneys, however, were a wealthy family and enjoyed fine clothes, music and many other things which Plain Friends despised as a hindrance to an intimate relationship with God. Elizabeth, on the other hand, grew up despising the Plain Friends. She found them utterly boring and saw their religion as lifeless and without feeling. She was looking desperately at the age of seventeen for a relationship with God which she could feel. Savery, an itinerant Quaker minister, arrived from America that year and showed her the power of a true relationship with God; the radical, intimate, and necessary connection with Christ that is the true heart of Quakerism, both historically and in the present. His preaching in their meeting helped Elizabeth feel God for the first time in her life. Slowly, and not without difficulty, Elizabeth found herself rejecting her family’s lifestyle and began becoming a Plain Quaker herself. Those words fall as easily from our lips as they did from Elizabeth’s when we experience the wonder of the promises of God. Darby’s prophetic word would indeed become true, but it began with Elizabeth being obedient in the simple things. She immediately began to teach poor children in her area how to read and write. Her newfound intimate relationship with God began expressing itself at once in an outward manner. When she left her home in 1800 to marry Joseph Fry, she had already developed a lifestyle which responded quickly to the needs around her. The key to the start of all her reforming work is simple: she heard Stephen Grellet talk about how bad things were in the prisons; she let it move her heart; and she acted immediately, going to see for herself, even spending the night in the prison to understand what the women were living through. From that first visit came later a committee of Friends to visit the prisoners, a school for the children, job training for the women prisoners, and the establishment of a whole new form of supervision in prisons across England and Europe. She saw as few did in that time the humanity of the prisoners, and shared with them her faith in Jesus. In her desire to bring change, she became the first woman to ever give evidence at a House of Commons committee. The pattern was set, and it continued for her entire life. When she saw a need, whatever the size, she looked for a way to be faithful in the little things to make a difference. Seeing the body of a homeless child in London in 1819, she worked with others to establish a homeless shelter there. In 1824, she visited Brighton and helped establish a society there which coordinated volunteers to visit the homes of the poor and help and provide care however they could. It was so successful, it was copied in many towns and villages across England. In 1840, she opened a school for nurses, inspiring the famous Florence Nightingale, who took a team of Fry’s nurses to care for wounded soldiers in the Crimean War. See a need, work with others, start small, make a difference. Near the end of her life she spoke before a Committee of the House of Lords, explaining the impact of Jesus Christ on the prisoners. The change in the heart that she saw in the prisoners was the same change in her own heart that compelled her to do the extraordinary. Unfortunately, the change that God brings to people does not necessarily make life work out perfectly. Her life was not an easy one. As her public role of prison reformer and minister in the Friend’s Church grew, so did the pressure and opposition. June Rose writes, “Throughout her life Elizabeth Fry…tried to reconcile her role of wife and mother with her work as a reformer.” [ibid., prologue] She suffered from periodic bouts of depression, criticism that she was neglecting her family, frequent sickness, and the embarrassment of her husband’s bank failing. She wrestled to live simply, while fighting her own desire for wealth and public accolade. Rose interprets this incorrectly as hypocrisy. I simply see it as refreshing honesty. She isn’t a perfect heroine, she is human like you and me. Sometimes our goals and desires show more clearly in one area than another, and our wrestling to be faithful in all things doesn’t always mean hypocrisy. It demonstrates instead Elizabeth’s openness to be in touch with that part of herself that was so very much unlike God. Her journal is an example of both the extreme difficulty and contented joy that makes up the life of faith. And that is precisely what she has to offer us today. It is neither easy nor impossible to live a life pleasing to God. We need both the commitment to obedience and the understanding of our own weakness that Elizabeth Fry demonstrated. The world we live in is a big one with big problems, and that realization sometimes freezes us into inactivity. The clear picture of Elizabeth’s life and the beauty of God’s plan frees us to live a life of faithfulness in the little things. The picture of the body of Christ, with each person doing his or her God-given part, is a picture our world needs to see and feel and experience today.